Medium size custom wallet for men made using pictures from you. Coated with clear plastic for protection. Once you make the purchase, please send us the pictures by email to naveh_m [!at] yahoo.com or here on Etsy's messaging. Make sure that the images are in good quality and not blurry. For this wallet we will need from you either 2,3 or 4 pictures. Dimensions of the wallet in inches: 4.1" X 4" X 0.6"
Features 7 slots for cards, 2 slots for cash, pocket for coins, a clear slot for an easy showing of docs/cards. Have an idea but can't find the pictures of it? Let us know and we will try to find it for you. I wasn't satisfied at all. One picture was ok but the second looked so fake. The wallet on the outside was plastic... Very disappointed. Inside was sturdy and nice tho. Would t recommend this product. First of all, in any case when a customer is unhappy with their purchase we always offer the option to return it and get full refund. So we did in this case. To address the claims, We use high quality laser printer to print the pictures. in deed one of the pictures had an awkward background. But that was how the picture was provided by the customer. 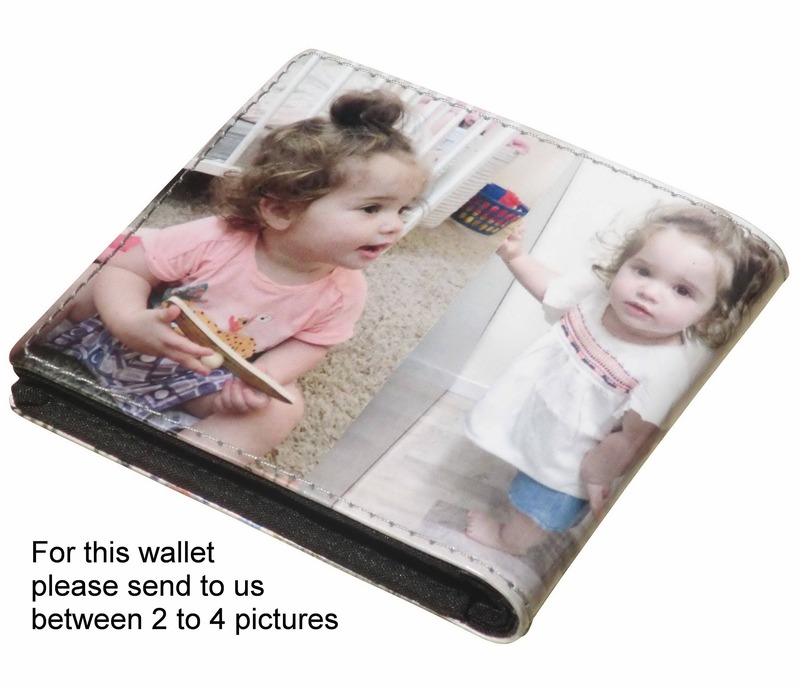 We trust our customers that they like the pictures that they want us to use for their wallet. As for the plastic coating which seems to be a surprise for the customer, the top sentence in the product description is "Medium size custom wallet for men made using pictures from you. Coated with clear plastic for protection". My daughter's father loved his wallet. The pictures were bright and bold! Very satisfied. The picture quality is great! My husband loves it!